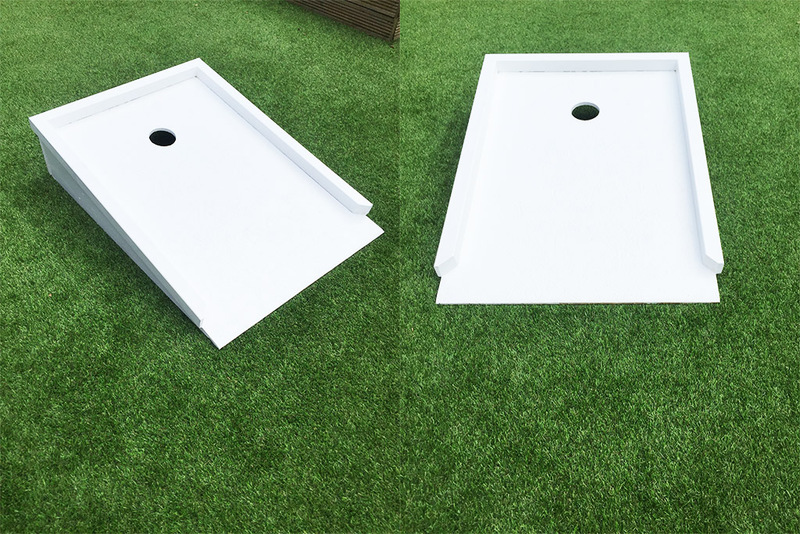 If you are looking to hire a new way of entertainment for your wedding, then our portable crazy golf is the perfect option. We offer competitive prices for either standard, premium or bespoke packages to suit all budgets. 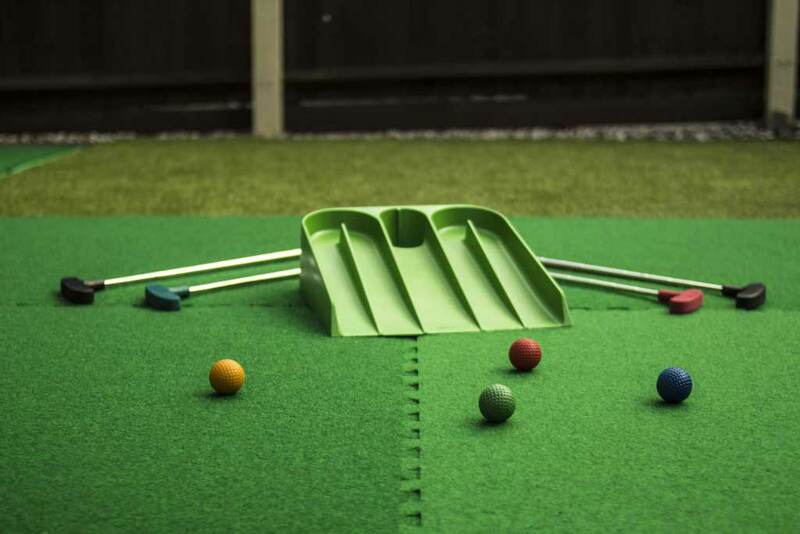 We hire a fully portable crazy golf equipment with bespoke crazy golf wedding obstacles available to go in line with your theme and colour scheme. Our mini golf courses are perfect to hire for wedding receptions, evening entertainment, wedding breakfast or any other moment of your wedding day. 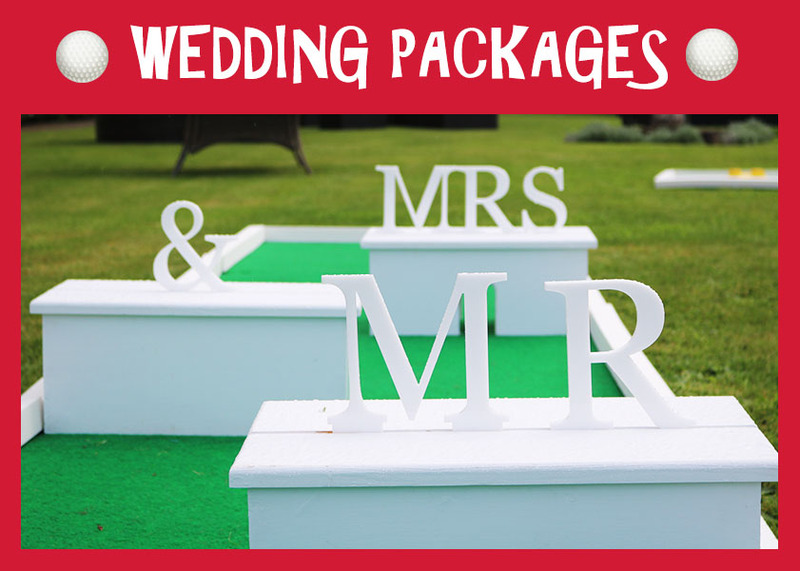 If you like playing golf or you are planning a golf themed wedding, then our wedding packages are perfect for you. 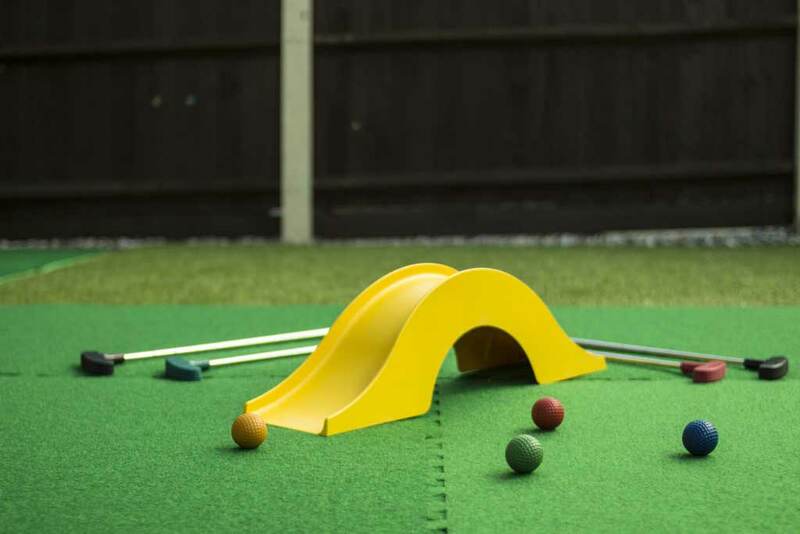 Our standard, premium or bespoke packages include the hire of up to 9 crazy golf courses which can be laid outdoors or indoors. 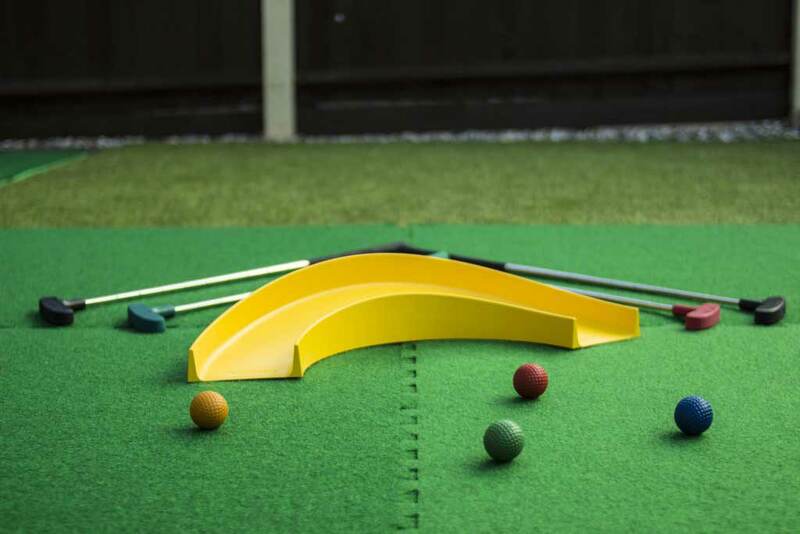 If you wish to see how we arrange our crazy golf equipment, please have a look at our full picture gallery by clicking here. 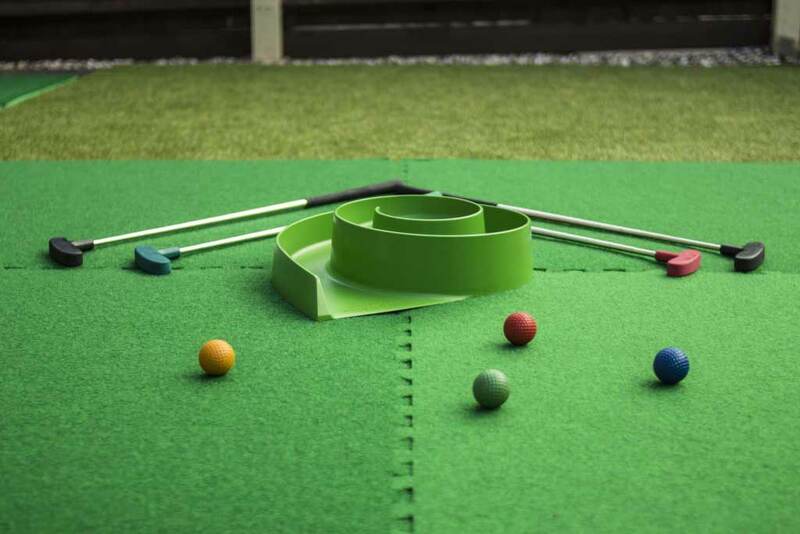 The crazy golf courses contain modular astro grass tiles that are very flexible to set up into various shapes and different obstacles with bespoke options available. Bespoke crazy golf wedding obstacle to hire for weddings or engagement party. The stand is made of wood and the letters are made of plastic. This design is an ideal addition to the other obstacles making the game more challenging. 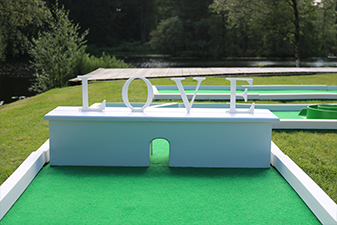 Hand made crazy golf wedding obstacles for your wedding entertainment. 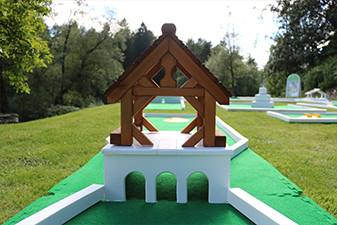 The church is a unique mini golf obstacle that will look amazing in your wedding photos and your guests will be impressed by the uniqueness of the obstacle. 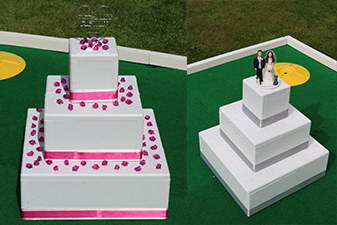 The wedding cake is a MUST for the crazy golf wedding. We can match the wooden cake with the colour scheme for your wedding. Extra decorations and accessories can be made to complement the cake. 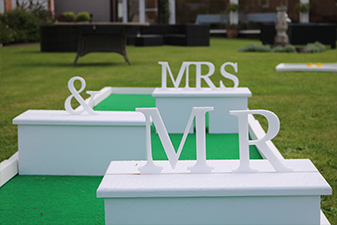 Our Mr & Mrs Golf Letters and made of strong wood and they have small entrances for the ball. This NEW obstacle allows the player to warm up before taking on more challenging obstacles. Made entirely of wood, the NEW Tricky House is a fun obstacle of moderate difficulty with 7 poles placed randomly. Exactly the right amount of swing is needed for the loop in order for the ball to travel all the way around, lining you-up for the end hole. You must get the ball across the bridge before you can attempt the final end hole. With the maze, only the central ramp will get you in the hole. This is one of the most challenging crazy golf obstacles. Two steep curves can be placed one after the other for a powerful swing. You can then send the ball into the final hole. The hole is at the highest point of the wave and it can be tricky to place it there from the first attempt. The spiral winds slowly upwards and needs the right amount of power to get the ball in at the top. We are fully dedicated to making sure everything goes well on the wedding day. 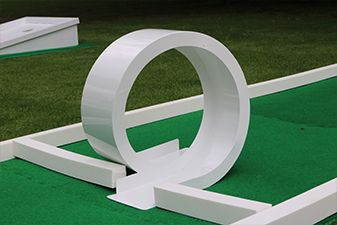 When you hire our crazy golf courses, there is no need to worry about installation. 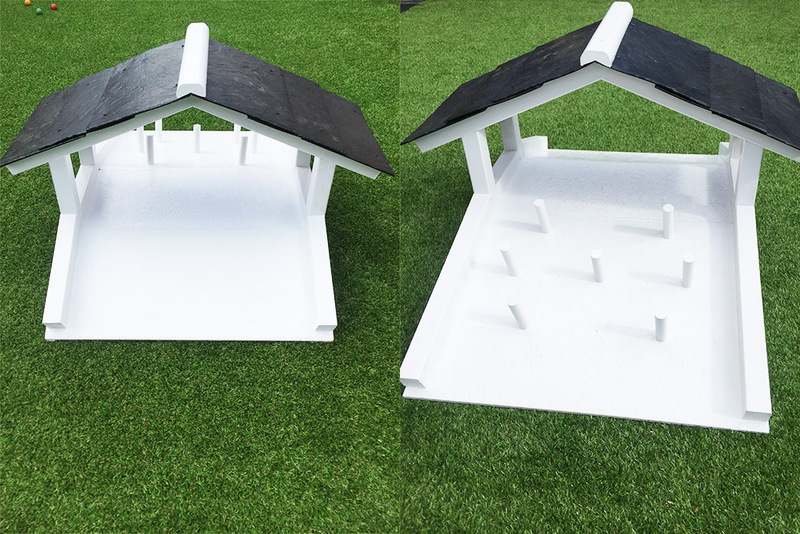 Our mini golf equipment is full portable and can be laid indoors or outdoors depending on your wedding venue. 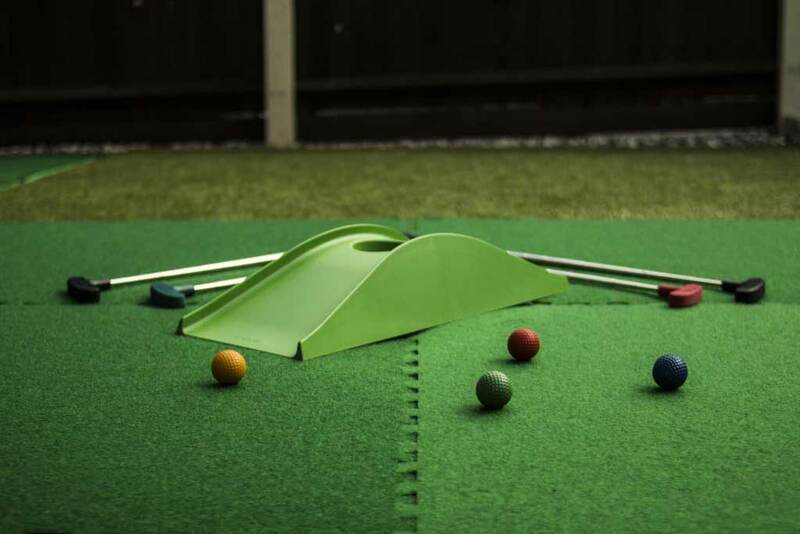 Check out what our customers are saying about Mobile Crazy Golf!